Broadly, all the different methods of building a trackbed can be group within three approaches: wooden (or plastic) planking between posts, solid concrete or blocks, or float the track in a bed of ballast (like the prototype). The first approach involves setting in posts, then doing some carpentry to create a track base between them. It’s a popular approach for raised railways, but can also be used for ground level railways like mine because you can build the ground up around the structure. Track is then screwed to the deck; ballast could be added for cosmetic purposes. I like this approach because it seems easy to make alterations. I dislike the idea of driving in all those posts. Also, at ground level, it’s not obvious how to prevent damp soil being in contact with the wood – and rotting it. Recycled plastic would be a better option, though not an especially cheap one. The second approach involves setting in concrete blocks, on pouring concrete, to form a foundation. Not being keen on the idea of creating a load of concrete that would become useless rubble in the event of any future alterations, the concrete block approach appealed more. Again, track could be screwed to the blocks, with cosmetic ballast. I’d worry about how easy it might be to fix an issues caused by blocks shifting due to frost or subsidence, though. The third approach was the one I felt instinctively drawn to. Flexible and prototypical, you just have to dig a trench and fill it with the right kind of ballast (about 2mm grade sharp gravel – the smooth stuff doesn’t interlock – surprisingly difficult to source, I found). This is where the fear of badgers comes in. The badgers in my garden like to dig stuff up. Fence posts and concrete seem to get a pass. They are either badger-proof, or just unexciting for badgers. But they’ll dig up all sorts of other things at random – and if it interests them (eg. my compost) they’ll shift any barriers or boulders you put in their way. If they happen to think there’s something of interest under loose ballast it’s a moment’s work for a badger to disperse it widely. To be honest, I’m not sure they wouldn’t shift concrete blocks if they took it into their heads, but at least it seems to make them stop and think. I still didn’t want to mix all that concrete (and besides, if the badgers undermine it, it’s likely to be the toughest to repair). So my compromise with the badgers was this: I’d dig a trench and I’d fill it with sub-base (this is MOT grade stuff that gets put under roads). This locks into a solid foundation, but without being as permanent as concrete. I’d then lay the track in a compound I’ve read about called ‘Rowlands Mix’. This is composed, traditionally, of peat, sharp sand and cement, with the peat encouraging moss growth to promote an overgrown look (just what I’m after). An alternative strategy used to encourage moss growth is spraying with live yoghurt – an action that is guaranteed to invite attention from badgers. The concrete in the mix is supposed to hold it all together a bit more firmly than just laying ballast loose – I’m hoping firmly enough to withstand casual investigation from brock and his chums. 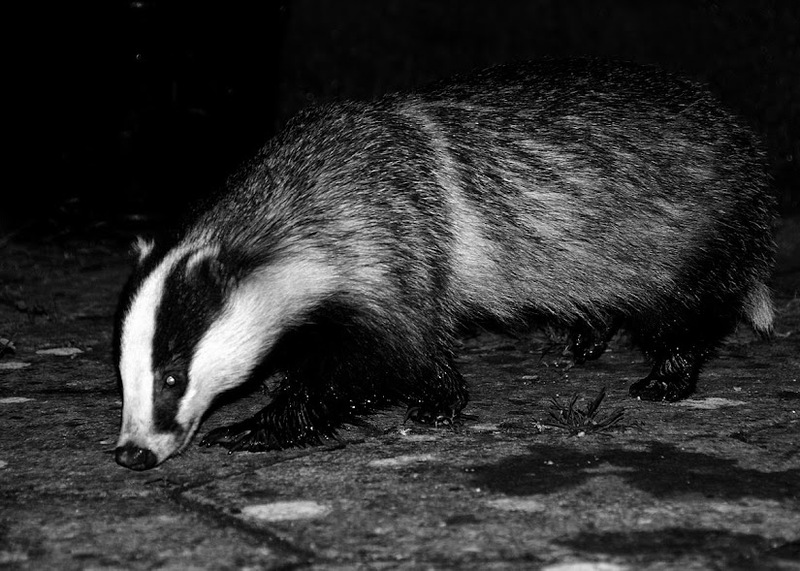 Image: «Badger 25-07-09 closer» av Chris. P – Flickr: Badger 25-07-09. Lisensiert under CC BY 2.0 via Wikimedia Commons. “For larger areas, you can prevent badgers digging deep holes by covering the area with tennis-court-type wire netting which is fixed a couple of inches below the lawn surface. Again the lawn grows through the mesh very well and this is very useful to stop badgers digging under sheds, foundations and buildings. It is a solution used by Badger Consultants who need to protect railway embankments and flood defences against burrowing by badgers, foxes and rabbits. Interesting solution – but the wire mesh would itself need fixing to something…. Some sort of post? It would need to be strong – and hidden too. Imagine being a ‘Badger Consultant’ There’s a title to fix to your office door with pride.